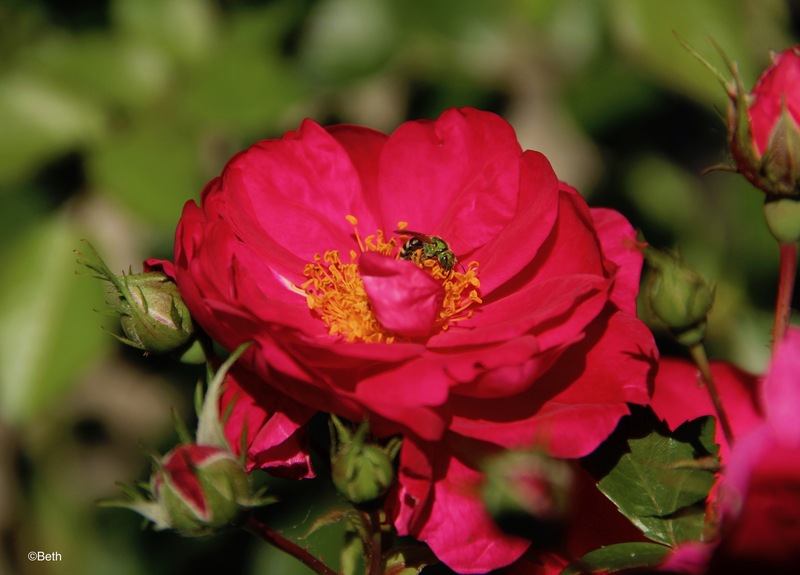 ‘Henry Kelsey’ roses are a favorite of green bees and many other native pollinators. I’ve always loved old-fashioned roses. When we were little, a neighbor raised beautiful tea roses that needed to be dug up and tipped into a trench to survive the winter — too finicky and too much work for me! Mom always grew rugosa rose bushes with deep pink blooms and orange rose hips. They were relatively hardy roses for central Minnesota, but often died back to the ground and started over again in the spring. When my husband and I bought our home, it included a small, single-car garage, like most older homes in the city. It seemed like a fine site for a climbing perennial. I tried growing two different types of clematis vines because I thought they’d be easy to keep alive. Turns out that neither one lasted more than two years. So, I took a chance on a rose. I looked for a hardy climber (zone 3 or 4) with a red blossom and found the Canadian Explorer Series of roses developed to withstand long, cold winters. The roses are named for early explorers of Canada. I found what I was seeking in the ‘Henry Kelsey’ rose. Planted on the south side of our red-brick garage, many of the canes remain green each year. In the toughest winter, it died back to 18 inches above the ground, but recovered quickly, bloomed well and on time. The roses, though simple, give off a light, spicy scent and attract many different types of bees. Red admiral butterflies pollinate them, too. Over the years, it has become a symbol of spring to me. I watch for the greening of the canes and the first red leaf buds to appear about the same time that crocus and Siberian squill bloom. 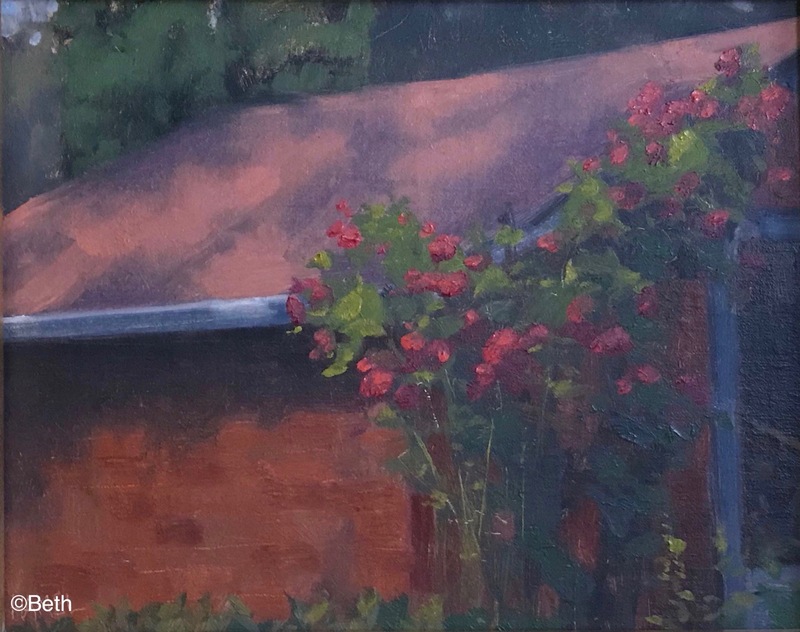 My husband painted the memory of a beautiful afternoon in the garden. My husband, who paints oil landscape and still life scenes in his spare time, painted the Henry Kelsey for me. It is one of my most treasured gifts. When I look at the painting, I remember the day clearly: A hot June Sunday, late afternoon, when our large apple tree shaded the garden. We’d finished a long walk and relaxed in the backyard with icy lemonade. Bumble bees hummed in the flowers, mourning doves cooed and robins caroled. The air smelled of ripening apples, bee balm and roses. It is a memory that I recall often, especially in February when I need a dose of summer.